By Michael Brooks and Rich Heidorn Jr. There is wide agreement among economists that exporting too much U.S. natural gas could expose U.S. consumers, industrial users and electric generators to much higher world prices. But there is no agreement on what is the tipping point, and how soon could the U.S. get there. The answer depends on at least three variables: How big is the U.S. supply? How much demand is there for U.S. exports? And what will be the impact of increasing exports on U.S. gas prices? Below, RTO Insider summarizes the current data and the projections on these variables. According to the U.S. Energy Information Administration, there was about 2,355 trillion cubic feet (Tcf) of technically recoverable gas in the U.S. as of Jan. 1, 2015. “Technically recoverable” gas includes proved (gas expected to be produced under current economic conditions) and unproved reserves (gas that is recoverable based on current technology, without regards to economics). The reference case of its 2017 Annual Energy Outlook (AEO) projects gas production to grow at almost 4% annually through 2020, about equal to the growth since 2005. After 2020, EIA projects a 1% annual production growth rate as net export growth moderates and domestic consumers more efficiently use their gas. In July, the Potential Gas Committee — a group of scientists from industry, academia and government — said that recoverable gas is about 20% higher than EIA’s estimate. The committee’s biennial report put the figure at 2,817 Tcf as of Dec. 31, 2016. The PGC’s new estimate represents a 12% increase over its previous report, the fifth consecutive increased projection. The group attributed the increase largely to a re-evaluation of production and development of shale gas plays across the country, with the Appalachian Basin plays — which include the Marcellus and Utica — especially having much more than previously thought. Alexei Milkov, professor of geology and director of the Potential Gas Agency at the Colorado School of Mines, presented the report in July at American Gas Association headquarters in D.C. He said the lopsided increase in the Appalachian plays is because it is more economic for gas producers to explore existing sites, rather than drill new wells. Producers also are drilling longer laterals when fracking and increasing their use of “slick water” — water with added chemicals that reduces friction, allowing for more efficient gas production. Last month, EIA reported that the U.S. has enough natural gas to last about 86 years, or about 2101, based on the 2015 consumption rate of about 27.3 Tcf per year. “The actual number of years will depend on the amount of natural gas consumed each year, natural gas imports and exports, and additions to natural gas reserves,” the agency said. EIA actually projects consumption rising to almost 40 Tcf by 2050, an average annual increase of almost 1.2%. The 2017 AEO reference case projects a total consumption of 1,227.2 Tcf from 2016 to 2050. This figure includes a maximum of 4.4 Tcf annually (about 12 Bcfd) in net LNG exports. Assuming consumption increases continue at about 1.2%/year after 2050, the U.S. would actually run out of gas in 2075, based on EIA’s supply estimate. Using the PGC’s total reserve estimate and the same consumption increase extends supply to 2083. The group’s estimate subtracted from EIA’s 2016 reserve estimate the supply from Alaska, a reduction of almost 7%. It did this because those Alaskan “resources are not available to consumers in the lower 48 states,” it said. This would put the lower 48 on track to run completely out by 2072. IECA says the Energy Department has approved exports of 20.6 Bcfd to non-FTA countries, almost equal to U.S. industrial gas consumption and almost three-quarters of the amount burned for power generation. “The U.S. should never agree to ship LNG to countries that subsidize their manufacturers and power plants,” the group said. U.S. natural gas exports jumped 30% to 6.35 Bcfd in 2016, a record high, according to EIA. Almost 92% of exports were via pipelines to Mexico (up 29% from 2015) and Canada (up 10%). Exports to Mexico, which have more than doubled since 2013, are expected to continue growing with the completion of pipeline projects currently under construction and as demand from new natural gas-fired generators in Mexico increases. Mexico, Canada and four other countries with free-trade agreements with the U.S. — Chile, South Korea, Jordan and the Dominican Republic — accounted for 44% of LNG exports in 2016, according to IECA. The remaining 56% was consumed by 13 non-FTA countries, led by India, China, Argentina and Japan. Exports to Canada have been increasing steadily since 2000, when the 1.3-Bcfd Vector pipeline began shipping gas from Chicago. The trend has accelerated since 2011 as several pipelines that had been importing gas from Canada were reversed in the Midwest and Northeast. As of March 2017, U.S. natural gas exports to Canada were 3.21 Bcfd and those to Mexico averaged 4.04 Bcfd. Although the U.S. remained a net importer of natural gas in 2016 — buying 685.3 Bcf more than it sold — net imports dropped 27% from 2015 and 50% from the previous five-year average (2011-15). In its AEO reference case, EIA projects LNG exports to exceed pipeline exports by the early 2020s, rising steadily before leveling at 4.4 Tcf in 2035. 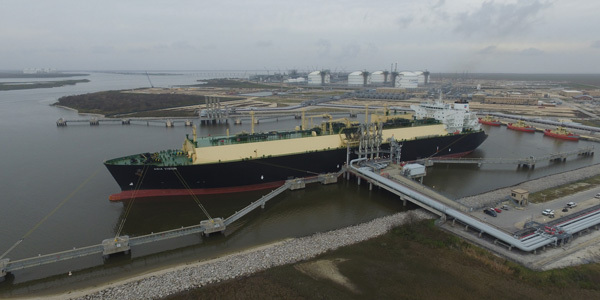 The two U.S. export terminals in operation — Cheniere Energy’s Sabine Pass LNG Terminal in Louisiana and ConocoPhillips’ Kenai LNG Plant in Alaska — have a combined capacity of 2.3 Bcfd. According to FERC, 11 other terminals with a combined capacity of 16.4 Bcfd have been approved, all but four of which have commenced construction. An additional 14 terminals with total capacity of 25 Bcfd have pending applications or are in the prefiling stage, the commission says. “After 2020, U.S. exports of LNG grow at a more modest rate as U.S.-sourced LNG becomes less competitive in global energy markets,” EIA predicts. Currently, most LNG is traded under oil price-linked contracts, but this is expected to change as the global LNG market expands, EIA said. However, the reference case also included fuel switching to gas because of EPA’s Clean Power Plan, which has been stayed by the Supreme Court and which Administrator Scott Pruitt is trying to rewrite. Natural gas consumption in the electric power sector is about 6% higher in the reference case in 2040 than the “No CPP” case. Consumption: How Much Demand Is There? Some analysts say the rush to build export facilities threatens to create a glut. For exports to be economic, the report notes, the delivered cost of LNG must be lower than the target market’s spot price. This “arbitrage window” is still open, but narrow, in the European and Asian markets — “quite remarkable, given how much spot natural gas prices have fallen in both regions over the last two years,” the report said. The two benchmark spot prices for the European (U.K.) and Asian (Japan/South Korea) markets had fallen to $4.69/MMBtu (down 40%) and $6.08/MMBtu (down 60%), respectively, as of Sept. 30, 2016, it said. The economics for exporting LNG, like those for converting to gas-fired power generation, are the product of the U.S. shale gas revolution that has dramatically reduced prices and increased supply. In its reference case, EIA forecasts Henry Hub prices nearly doubling from $2.50/MMBtu to $4.90/MMBtu between 2016 and 2020. Average delivered prices rise a more modest 48% over the same period. Under EIA’s high oil price scenario, Henry Hub prices increase 75% by 2020, with average delivered prices rising 37%. The scenario assumes a barrel of Brent crude oil — currently priced at about $50/barrel — reaches $226 by 2040, compared to $109 in the reference case and $43 in the low oil price case. The high oil and gas resource and technology case — which models lower gas costs and higher supplies than in the reference case — predicts a 60% increase in Henry Hub prices and 31% in average prices by 2020. The lower prices increase domestic consumption and exports. In comparison, in the low oil and gas resource and technology case, “prices near historical highs drive down domestic consumption and exports.” Henry Hub prices rise by 131% by 2020, while average delivered prices rise by about two-thirds. 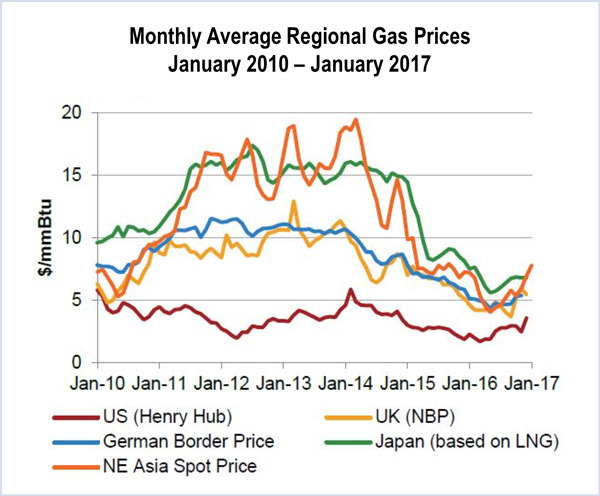 Henry Hub, long the benchmark for U.S. gas contracts, is increasingly helping to set international prices. In the first six months of 2017, the volume of Henry Hub futures traded outside of typical U.S. trading hours jumped 31% compared with the same period last year, according to the New York Mercantile Exchange. Kenneth Medlock, senior director of Rice University’s Center for Energy Studies, says added LNG exports will not have a substantial impact for almost a decade because the large amount of LNG supply coming online globally will prevent the U.S. from exporting more than 12 Bcfd before 2025. Medlock coauthored with Oxford Economics an October 2015 study for the Energy Department on the macroeconomic impact of increased LNG exports. It concluded LNG exports raised domestic prices somewhat and lowered prices globally, with Asia most sensitive to price movements. It projected that if LNG exports met a global demand of 20 Bcfd, it would only increase U.S. GDP by 0.03 to 0.07%, or $7 billion to $20 billion at today’s prices. Australia’s surge in LNG exports provides a cautionary tale for the U.S. The country, which exported 62% of its production last year, was hit with a February heat wave that resulted in domestic shortages, spiking prices to as high as $17/MMBtu and leading to blackouts. It was responsible for 17% of LNG exports in 2016, second only to Qatar (30%). Such a crisis is unlikely soon in the U.S.: The country would need to ship about 45 Bcfd — seven times its current rate at current production levels — to match Australia’s exports as a share of total production. The Northeast Energy Direct pipeline project is the best way to lower electricity prices and increase reliability, the staff of the NHPUC said in a report.